Does laser teeth whitening work? How long do the results last and how can I maintain them? How much does a laser teeth whitening procedure cost? How does it compare to other whitening treatments? Laser teeth whitening uses a laser to activate an application of peroxide-based bleach. Teeth whitening is a result of the bleaching gel, not the laser itself. Results from laser teeth whitening usually last 6–12 months. Bleach is the most common agent for whitening teeth. Your dentist will apply a professional-grade peroxide gel to your teeth using a bleaching tray. The in-office peroxide gel typically has a bleach concentration ranging from 25-40%; in comparison, over-the-counter bleaching gels usually don’t go above 10%. A laser will then be used to activate the gel. The heat generated by the laser is said to speed up the bleaching process (more on the efficacy of this below). All in all, the whole process generally takes about one hour. Steps will be taken to protect your mouth from the laser and bleaching gel. You’ll be outfitted with cheek retractors to pull back your cheeks and lips, and your gums will be covered with rubber dams or a protective gel. Your dentist may also apply fluoride or another desensitizing agent to reduce your teeth’s reaction to the procedure. In a word, yes, but it doesn’t work in all situations — and not because of the laser. Below, we explain the efficacy of laser teeth whitening focusing on the three components of this process: the bleach, the strength of in-office treatments, and the laser. Bleaching isn’t effective for caps, veneers, crowns, fillings — any specially fabricated dental material — that isn’t natural tooth enamel, as these inorganic materials have a different chemical and molecular makeup than teeth enamel. For those with natural teeth, bleaching is effective against certain kinds of discolorations, such as yellow stains caused by food and beverages, but it might not work on brown or gray stains or those caused by medications or injury. “A good indicator is to look at the whites of your eyes and compare to your teeth. If the whites of your eyes are whiter, you will most likely whiten up easily. If they are more yellowish, whitening will be more of a challenge,” says Dr. Benjamin Lawlor, a dentist practicing in Gray, MN. Any in-office professional whitening treatment will work faster than over-the-counter products because of the higher concentration of peroxide in the bleaching gel. While laser manufacturers claim the light and heat from the laser accelerates the bleaching process, the American Dental Association (ADA) disagrees. In sum, the results will be a result of the bleaching gel, not the laser itself. Generally speaking, results from a single laser teeth whitening procedure will last anywhere from six months to a year. There are also some steps you can take to maintain your results longer. “A person’s diet and the structure of their teeth play a huge role in the effectiveness of any whitening,” Dr. Lawlor notes. Try to avoid beverages that stain teeth such as wine, coffee, and tea (or use a straw to reduce contact with teeth), especially in the first 48 hours after the procedure. Soda and sports drinks can also stain teeth as they contain acid that breaks down your enamel, making teeth more susceptible to staining. Deeply pigmented foods such as pasta sauce, curry, balsamic vinegar, and berries can also contribute to tooth discoloration. To preserve your newly whitened smile, drink plenty of water and choose foods that help fight discoloration, such as apples, celery, and cheese. Clean your teeth immediately after eating, brushing when you can and rinsing your mouth out with water when you can’t. Of course, outside of this, you should continue to observe good oral hygiene, brushing and flossing your teeth twice a day. Brushing with a whitening toothpaste can also help maintain your results. Look for the ADA seal of acceptance while shopping to ensure you’re purchasing an effective product. The cost of a whitening treatment will vary by location and dentist and will also depend on the severity of your tooth discoloration. That said, you can expect to pay approximately $1,000 for one treatment, and since this is a cosmetic procedure, it probably won’t be covered by dental insurance. This cost can add up over time, as you will need to have the whitening redone every six to 12 months if you’d like to maintain your pearly whites. While laser teeth whitening works well, it can be a bit too expensive for many. 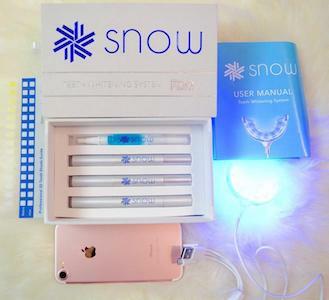 Snow offers a more affordable at-home teeth whitening system that is highly rated. With or without a laser, teeth whitening has been known to cause teeth sensitivity. “So far, we have found that [laser teeth whitening] does cause the most sensitivity out of all the whitening protocols because of its intensity,” Dr. Lawlor says. After bleaching their teeth, many people find it difficult to consume very hot or cold food and drinks, or to bite into hard and crunchy food. The bleach may also irritate the soft tissues in the mouth, especially if the bleaching gel accidentally spills over the bleaching tray, which can result in gum inflammation. Hypersensitivity may vary according to each patient as well as the type and concentration of bleach used in the whitening treatment. Certain kinds of lasers used in teeth whitening processes may also heat up the tooth itself, which can cause hypersensitivity beyond that of bleaching, as well as other possible side effects. More research is needed on the safety of heating up the tooth pulp with a laser, as the current literature is not conclusive. Laser teeth whitening is very similar to receiving an in-office professional whitening treatment with bleach only. Since there isn’t any evidence that light activation with a laser increases the efficacy of the bleaching gel, you can opt for a professional bleaching-only treatment, such as Zoom teeth whitening. Your dentist may create a custom tray for your teeth and have you whiten your teeth on your own at home over the course of a few weeks or months. This procedure takes longer than in-office treatments but it’s often less expensive. As for DIY methods, whitening toothpastes can remove minor surface stains via mild abrasives but they can’t change the color of teeth. Over-the-counter bleaching kits or strips can help whiten your teeth, but they’ll have an even lower peroxide concentration than a take-home kit from your dentist (and a much, much lower concentration than an in-office treatment), so you won’t see results quickly. In both cases, look for a product with the ADA seal of approval to ensure you’re buying something that’s safe and effective. De Moor, R. J. G., Verheyen, J., Verheyen, P., Diachuk, A., Meire, M. A., De Coster, P. J., … Keulemans, F. (2015). Laser Teeth Bleaching: Evaluation of Eventual Side Effects on Enamel and the Pulp and the Efficiency In Vitro and In Vivo. The Scientific World Journal, 2015, 835405.